Just three months after a paper outed a gene for a mitochondrial protein as a potential cause of amyotrophic lateral sclerosis-frontotemporal dementia, four new publications have made the case clear. CHCHD10 is an ALS/FTD spectrum gene. A handful of different mutations in the gene whose acronym stands for the tongue twister coiled-coil-helix-coiled-coil-helix domain containing 10 cause a range of symptoms comprising ALS-FTD, ALS, and also mitochondrial myopathy, according to the studies. 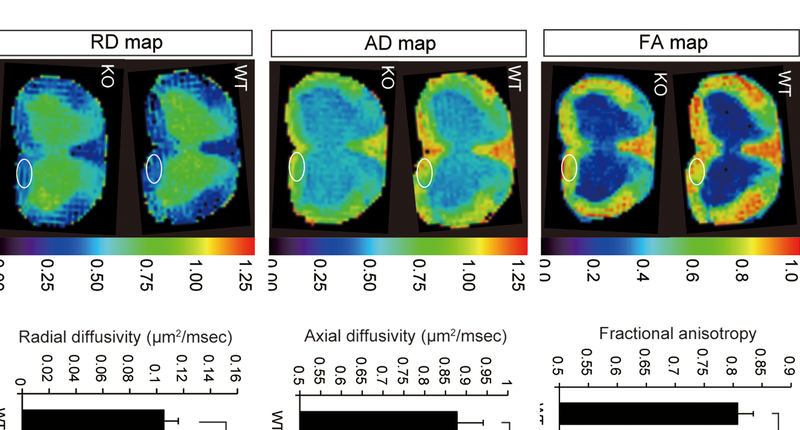 “It became clear in recent weeks that this is a ‘true’ ALS gene,” wrote Jochen Weishaupt of Ulm University in Germany, author on one of the new papers, in an email to Alzforum (Müller et al., 2014). 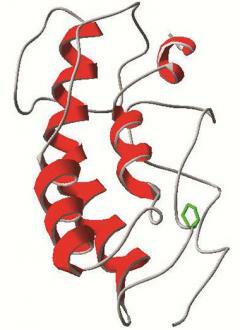 Researchers developed this model for CHCHD10, based on the known structure of related protein CHCHD5. Proline 34, which is mutated to serine in some cases of ALS, is highlighted in green. Last June, Véronique Paquis-Flucklinger and colleagues from the Université de Nice Sophia Antipolis in France described a French family with a type of myopathy plus atypical ALS-FTD features due to a serine-59-leucine CHCHD10 mutation, and a single Spaniard with ALS-FTD due to the same amino acid swap (see Jun 2014 news story). In July, the same authors followed up with publication of two more cases, proline-34-serine mutations this time, from a French cohort with FTD-ALS (Chaussenot et al., 2014). In August, Weishaupt and colleagues added two Germans with ALS due to arginine-15-leucine mutations and a Finn with ALS caused by a glycine-66-valine substitution. Then in September, scientists led by Teepu Siddique of Northwestern University Feinberg School of Medicine in Chicago reported CHCHD10 mutations in a Puerto Rican family. In this kindred, which exhibited mitochondrial myopathy, members carry two substitutions in the gene, arginine-155-serine and glycine-58-arginine (Ajroud-Driss et al., 2014). Siddique originally reported the CHCHD10 finding at the 2012 American Academy of Neurology meeting in New Orleans (Ajroud-Driss et al., 2012). In the latest paper, a letter in the September 26 Brain online, researchers from the National Institute on Aging in Bethesda, Maryland, describe one family and two unrelated ALS cases due to an R15L substitution in CHCHD10. This finding results from the first whole-genome sequencing of familial ALS cases by a consortium led by senior author Bryan Traynor of the NIA. All told, that makes 11 published families or cases with CHCHD10 mutations. Experts who spoke with Alzforum estimated that mutations in this gene might account for 2–5 percent of ALS and ALS-FTD cases. The French kindred published in June had a primarily muscle disease with some features reminiscent of ALS and FTD, leading ALS clinicians to question how appropriate it was at that time to label CHCHD10 an ALS gene. Including the new cases, the phenotypes span pure ALS to ALS-FTD to myopathy. Bulbar symptoms—problems with speaking or eating—are common in the cases reported so far. Several of the newly reported cases “do sound more like ALS than the cases in the original paper did,” commented Richard Bedlack of the Duke ALS Clinic in Durham, North Carolina (see full comment below). “The ALS is atypical because of the slow progression, but that is within the range of what we see in our clinics.” People with CHCHD10 mutations have survived for up to 17 years past the onset of symptoms in Paquis-Flucklinger’s original report, compared to two to three years for typical ALS. In the September Brain paper, first author Janel Johnson of the NIA and colleagues initially tried whole-exome sequencing to identify the disease-causing mutation in four people from a large family with ALS. Though the CHCHD10 substitution occurs in an exon, technical trouble kept it from coming to light, said co-author Ekaterina Rogaeva from the University of Toronto. Sometimes, certain areas of the exome are incompletely sequenced, for example when DNA primers bind poorly. Johnson and colleagues had to use whole-genome sequencing to find the CHCHD10 mutation. The high proportion of guanine and cytosine in the CHCHD10 gene could have interfered with the exome sequencing, agreed Paquis-Flucklinger and colleagues in a response to Johnson’s work (Bannwarth et al., 2014). The strong bonds between those nucleotides can interfere with sequencing and primer binding due to their high melting temperature. “The coverage and reliability of whole-genome sequencing is better than whole exome,” Rogaeva said, suggesting other genetic sleuths should take note. CHCHD10 provides the strongest evidence yet that mitochondria contribute to motor neuron disease, Rogaeva noted. Little is known about the protein’s function; it is thought to contribute to oxidative phosphorylation (Martherus et al., 2010). Paquis-Flucklinger and colleagues reported that their myopathy patients had disorganized mitochondria with fragmented DNA. The scientists have suggested the mutation could interfere with protein stability or protein-protein interactions. In ALS cases, the pathology appears different, Siddique told Alzforum. In work not yet reported, his group analyzed spinal cord tissue from people with CHCHD10 mutations who died of ALS. The Chicago scientists saw skein-shaped cytoplasmic inclusions and denervation characteristic of the disease. “Mitochondria may contribute to the disease, but the problem is proteins that aggregate elsewhere,” Siddique said. Traynor continues to collect cases for sequencing, and Rogaeva predicts other ALS genes will be found in the next several years.